Candles and music evoke an atmosphere of tranquil mystery during the Taizé-style prayer service, at 6:30 p.m. on the third Wednesday each month at PEACE Lutheran Church. 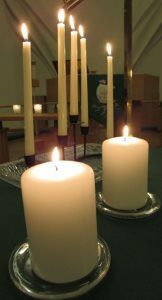 On the third Wednesday evening of each month, PEACE Lutheran Church sees candlelight filling the darkened Sanctuary. Chants of simple-yet-sacred words set to modern-yet-timeless music fill the room. Taizé Evening Prayer unfolds. Taizé is a pattern of worship that developed in the Taizé monastic community of France in the 1940s. It started as a consciously ecumenical effort, inviting Protestants, Catholics and others on a spiritual path. Journeyers explore the spirituality that arises with prayer, Bible readings, chants, silence, unity, supplication and service. This ancient way of seeking God holds remarkable meaning and appeal in our modern age, distracted as we are by noise and overwhelming social connection of every kind. Learn more about Taizé-style worship. Find PEACE at 828 W. Main St., Grass Valley, Calif. – near downtown. We have ample parking. If you need to drop off a passenger, please drive all the way around the building (to the left) and proceed to the carport. There to your left, you will see glass doors leading into the Atrium and our Sanctuary.